Holding hands is a pretty intimate thing. Who do you hold hands with? Your spouse? Your boyfriend? Your friend? Your child? We don’t walk up to complete strangers and just start holding their hand. That would be creepy and awkward. Holding someone’s hand is something you do because those people mean something to you. I saw you holding hands with a high school boy! When I was teaching school in Idaho, where my husband and I first met, one of my students said to me, “I saw you holding hands with a high school boy yesterday.” I couldn’t think what she was talking about, but then realized I had been out walking with my boyfriend, now husband. He’s actually 7 1/2 years older than me, but he did look pretty young. That little girl knew that holding hands meant something was going on. I was in some sort of relationship with that young man. She was right. In our verse for this week, God says He holds our right hand. He also says, “Do not fear, I will help you.” That is the kind of hand holding we find ourselves needing when we’re feeling insecure, frustrated or pushed to the side. God is there for us. He takes up our hand and leads us through the troubles. But He doesn’t let go. He keeps holding on in the good times as well. It’s not awkward when God holds our hand, because we know Him, and He knows us. We have a relationship with Him. Many of us hold the hands of our children (my boys are pretty grown up now, so I don’t get to do this as often.). We may take their hand when they’re crossing the street. We want to make sure they are safe. God takes our hand and makes sure we’re safe as well. Safely in our relationship with Him, that saving relationship of faith in Jesus as our redeemer. We also take our child’s hand when we want to help them feel secure. And best of all we take our child’s hand to show them that we love them. It doesn’t really matter what they’ve done, we still love them. Sometimes we even take our child’s hand in discipline. We pull them back from the bad behavior in which they’re engaging. But we do this, like God does with us, because we have a relationship with our children. A close relationship. We wouldn’t want someone who doesn’t know them well taking them by the hand. It makes us uncomfortable. The better we know God, the more comfortable we are when He’s got our hand leading us through life. I remember the butterflies I had when a boy I liked finally made the move to hold my hand. It assured me that he had feelings for me, more than being a friend. He wanted to get to know me better. I was special. I was His. God too holds our hand this way. He claims us as His. We’re with Him. We’re with God. When I was growing up we didn’t hold hands while we prayed. As an adult Christian, many of the people I know hold hands during the blessing around a table. Some also hold hands as they pray among two or three friends. Sometimes even larger groups will join hands in prayer. Why do we do that? I think it is to create a feeling of unity. Even if we don’t know the person well that we’re standing next too, we know that they’re holding hands with the Savior too, and we’re all unified at that moment. Sometimes we don’t know what to say. 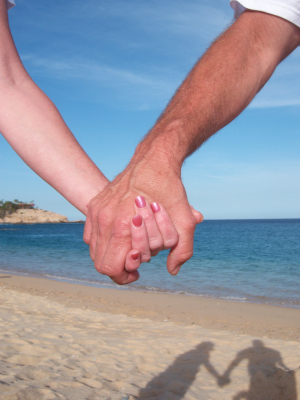 Sometimes holding hands may be the only way we know how to convey our care for someone. I remember visiting my grandmother in the hospital a few months before she died. She was really unwell and very old. She wasn’t 100% clear on who I was. There wasn’t a lot I could say to her that she would be able to respond to correctly. So for much of the visit I held her hand. That was so wonderful to me, because in holding my hand, I could feel her loving squeeze. Holding my hand said what she couldn’t get the words to say anymore. (Was I comforting her, or was she comforting me? Hard to tell). No matter how God is holding your hand, the point is, He’s holding it. We don’t have to be afraid. God’s with us. He’s got our back and is going to see us through the good times and the bad. God, I wanna hold your hand! Whose hand are you holding?